The study of archeology never gets old. Successive academic regimes have, more often than not, fashioned graven images of the past in their own image. Hence, there are practically no interpretations of ancient artifacts and texts not contaminated by the present. Will Corwin has chosen to work within this premise of archeological projection, and further, to ventriloquize its forms for a contemporary audience. So, what happens when an archeologically derived artifact is remade in the likeness of the artist’s own ontological projection? The layout of this show of mostly small to medium sized cast sculptures is centered around a large, floor–orienteden–closure, the kind one might see in a museum dioramic recreation of an archeological dig. It’s title The Map Room (2018), is a direct reference to a scene in the first of the Indiana Jones movies in which the protagonist divines a secret key to finding the Ark of the Covenant. Corwin is not above this kind of layered ironic play and, in fact, this ludic element lends the entire show a buoyancy that helps deracinate fundamental presumptions about the cultural deployment of the archeological record. While not exactly a rogue academic like Jones, the artist shares the character’s fatalistic sense of irony. The piece consists of a field of sand enclosed by a low plywood wall (looking nothing so much as like a grown-up sandbox). Scattered about it in both random and ordered array are combinations of plaster cast (in sand) architectural elements, and diminutive god figures. These include individual works entitled Tired Cucifix i, Amnophis iv, and Gudea (all 2018). Surrounding this are larger rib-like castings that seem more appropriate to an ancient Mastadon than an archeological dig. The mash up of all these elements prevents a determined reading of a unified cultural thematic, therefore serving the artist’s purpose to use the mode of archeological discovery without being shackled to its enervating museological re-entombment. It is important here to discuss the way in which Corwin transforms his historical source material as this is where his real talents lie: in a crude, Art Brut tactility that engages the viewer on a very basic level. His approach to fabricating these small sculptures reveals, in a very friendly yet primal way, the methods of their making. 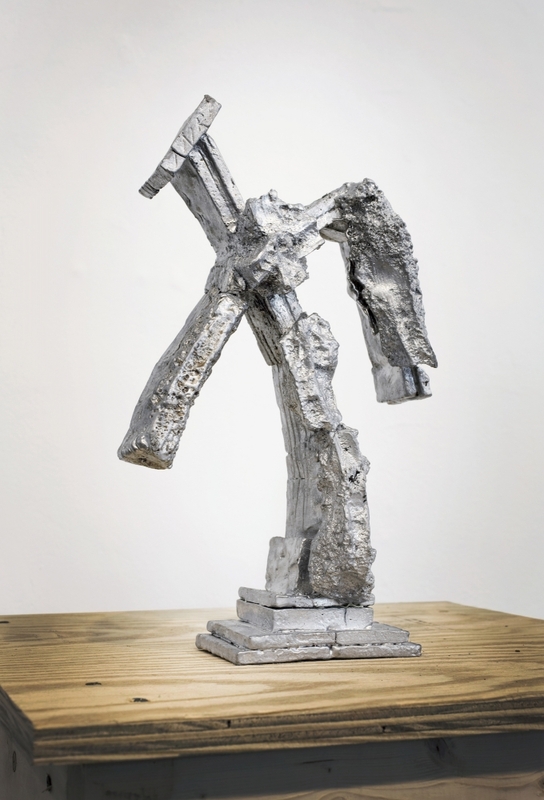 Corwin openly shows the cutting, abrading, fragmentation, and reassembly of his initial plaster models that at times remain in this basic state or are used as models for casting in pewter and lead. Examples such as Pazuzu and Tired Crucifix ii (both 2018) are cast in pewter, a material that has an alternating reflective and absorptive quality that directly relates to it alloy of tin and lead. The former’s title refers to the ancient Mesopotamian god of the wind, often seen as an evil spirit (and portrayed as such in the 1973 film of William Peter Blatty’s novel The Exorcist), yet Pazuzu was apparently also deployed to scare away other, perhaps lesser, evil demons like those that would endanger a healthy childbirth. This equivocal nature of the god’s ancient usage dovetails well with Corwin’s amateur archeological reveries, and seems a sly nod to the notion of “contingency” so often batted about in contemporary art theory. The Tired Cross sculpture similarly plays with archeological surety in its conflation of the ultimate Christian symbol with art historical depictions of the limp, deposed figure of Christ therefrom. This open-ended combination of history, pop culture, and a very tactile fabrication, lends Corwin’s work its own aesthetic strata that aims to compete alongside the archeological record. Two standout pieces in the show are Teeth (2018) and George III (2017). The first is a stack of sand-cast plaster “teeth” (that could have been pulled from a Dubuffet head) that is bound with two straps of rope, giving this piece the features of a “primitive” fetish bundle. The proximity of teeth and sand warps the mind further toward an inevitable grinding association and the anxious milling this implies. The leaden George III sculpture is inspired by an incident in 1776 New York City when angry colonists pulled down a statue, located in Bowling Green, of their soon to be erstwhile monarch (which was also made of lead) in order to melt it into bullets for the revolution. Pitched awkwardly forward onto the nose of his steed the excoriated representation of the king symbolically undermines the divine right of history to a chosen few, an idea which surfaces again and again in Corwin’s project.